300 pages | 14 Color Illus. | 10 B/W Illus. This book explores engineered nanomaterials (ENM) pulmonary effects and familiarizes readers with unique aspects of nanomaterial application and research. Focusing on the diagnostic and therapeutic utilities of nanomaterials in different lung diseases, it discusses the novel applications of nanotechnology for the treatment of airway diseases such as asthma, allergy, chronic obstructive pulmonary diseases, cystic fibrosis, and lung cancer. In an attempt to synchronize the efforts of pulmonary biologists, chemists, and clinicians in developing novel nano-based tools for airway diseases, the book also discusses the strategies to overcome the pathophysiological and technical barriers. "Pulmonary Nanomedicine presents comprehensive information on emerging nanotechnology applications in diagnosing and treating pulmonary diseases. It describes numerous drug delivery, gene delivery, and theragnostic approaches for managing pulmonary disease outcomes. The book’s editor, Dr. Neeraj Vij, is an expert in pulmonary medicine and has done an excellent job in producing a high-class textbook." 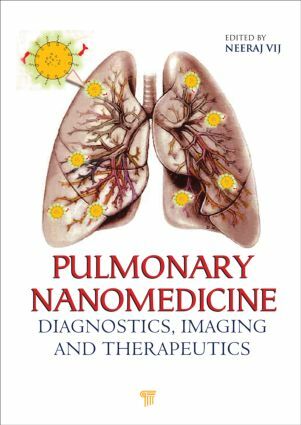 "This book is a comprehensive treatise on emerging nanotechnology applications in the diagnosis and treatment of pulmonary diseases. It beautifully presents new drug delivery, gene delivery, and theragnostic approaches to improve pulmonary disease outcomes."